Repeat of one of my old favorites: And it makes for the most beautiful pictures. I couldn't stop snapping photos, it was so colorful! Melt margerine in a large saucepan over medium heat. Cook onion 5 minutes, until softened. Add garlic, curry powder, ginger, salt and pepper and cook 1 minute more. Add broth, sugar, water and puree; mix well. Reduce heat to low. Stir in coconut milk. Puree soup in blender in batches until smooth. Heat through before serving.Adjust seasonings - sometimes needs a pinch more sugar, or salt or cayenne - depending on your tastes. Garnish with whatever green herby things you can find. **I cut small sugar pumpkins or squash in quarters and roast until soft, then puree with a little vegetable broth for this recipe. 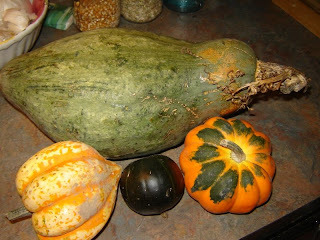 Today I used the hubbard squash. 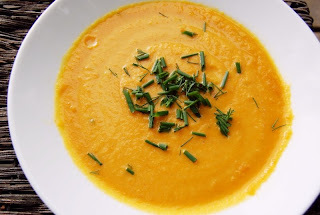 It looks fantastic and is one of my favorite soups!